Since 2007, the AS/COA Cuba Working Group (CWG) has been at the forefront of a changing U.S.-Cuba relationship. These efforts were evident in the historic rapprochement in December 2014, which reflected our recommendations and policy outreach work in Washington. The working group encourages the current U.S. administration to continue to pursue a policy of engagement with the island. CWG serves as both a discreet bridge between the private and public sectors in the United States and Cuba, and as an extraordinary repository of policy knowledge on bilateral relations. The group navigates Cuba’s changing economic and political landscape and U.S. ties, and helps businesses understand the changing regulatory framework, investment opportunities, and areas for collaboration. Current CWG members include telecommunications companies, financial service providers, law firms, agriculture and food production companies, and energy companies, among others. High-level meetings and roundtable discussions with Cuban and U.S. government officials, leading Cuban economists, entrepreneurs, senior-level business leaders, and members of the international diplomatic community, among others. Business delegations to Cuba on invitation from Cuba’s Ministry of Foreign Affairs and Ministry of Foreign Trade and Investment with senior-level business leaders. Outreach work in Washington to continue to push for full normalization of bilateral relations. Contact the Cuba Working Group at cwg@as-coa.org. Read more Cuba headlines in the News, Op-Eds, and Articles tab. Lifting the embargo on Cuba "is not a matter of if, it's a matter of when," U.S. Congressman Tom Emmer told AS/COA Online a couple of months after introducing a bill to end the embargo. In this video explainer, AS/COA's Alana Tummino joins Emmer and U.S. Commerce Department's Kelly Welsh on the implications of changing relations. Plus, Economist Ileana Díaz Fernández of the University of Havana reminds us change will take time, and that "a relationship of neighbors rather than enemies" is already a good start. AS/COA Explains is a video series exploring game-changing topics in the Americas. Watch other episodes. What's Next on the U.S.-Cuba Agenda? Interview: Ted Henken on Raúl Castro's "Economic Mambo"
Castro Insists Cuba Won't Abandon Communism Despite Deal With U.S. Audio: Christopher Sabatini - "New Cuba Relationship Could Be A Boon For American Farmers"
Mess in Venezuela Is One Reason Cuba Turned to the U.S. The Beginning of the End of the Embargo? NYTimes.com: Should the U.S. Normalize Relations With Cuba? Are Chances Improving for Better Business Ties With Cuba? Ping Pong Diplomacy: Will Cuba Catch Up? Written in collaboration with the Brookings Institution and the Cuba Study Group, this white paper outlines ways that public and private sector can buiild access to technology and telecommunications services in Cuba. Embargoes only hurt the people they are trying to help, said Representative Tom Emmer, who introduced the Cuba Trade Act of 2015 along with Representative Kathy Castor (D-FL). Though Democrats have been supportive since the start, Emmer says he has also received support from Republicans, which make up nine of the bill's 10 cosponsors. Emmer went on to describe his experience visiting Havana, as well as Minnesota's trade relations with Cuba over the last decade. Watch more videos of the conference "Cuba: The Year in Review and a Look to the Future." 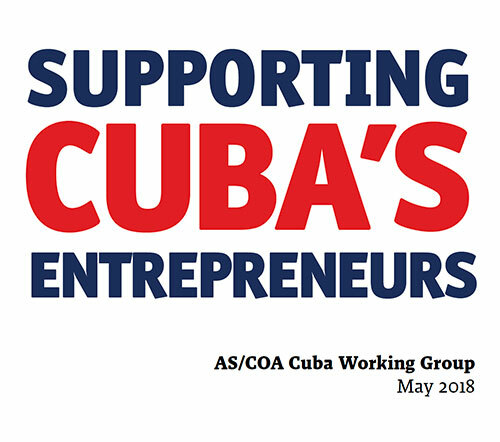 Learn more about AS/COA's Cuba Working Group. The United States is loosening regulations for investing in Cuba, but much ambiguity remains. Yosbel Ibarra and Emilio Morales clarify and explain which sectors offer the most opportunities, even without the full lifting of the embargo. Despite the Cuban government's control of the economy, recent reforms are widening Cubans' opportunities to open private businesses. Just by looking at the distinct culture of remittances in Cuba, it's easy to tell Cubans are eager to be productive, said Western Union's Pia De Lima. Unlike most countries in the world, Cubans use a majority of the remittances they receive to finance microenterprises rather than pay for everyday expenses. Two visiting scholars from the University of Havana discuss the U.S.-Cuba rapprochment in the context of Cuba's economic reforms. AS/COA's conference "Cuba: The Year in Review and a Look to the Future" opened with a discussion with representatives from the U.S. departments of Commerce and State. They explored the main regulatory changes on trade and travel to Cuba implemented recently by President Barack Obama's admnistration, among other topics. As Cuba lifts investment and trade barriers to boost economic growth, the U.S. embargo on the island remains in place. 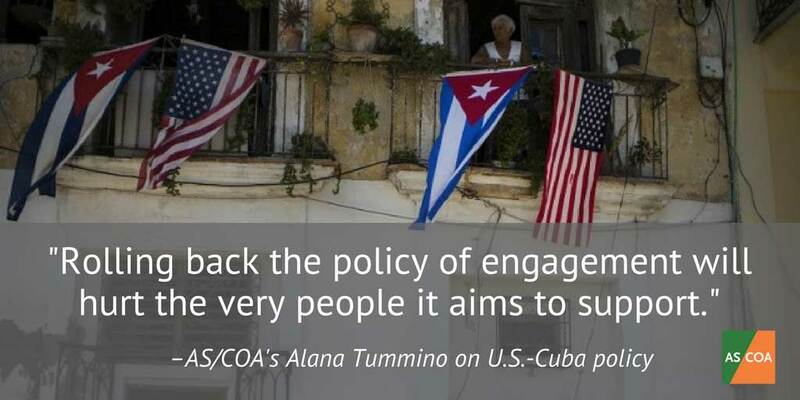 "[Cuba is] trying to raise $8 billion in investments related to energy and mining and oil and agriculture," AS/COA Policy Director Alana Tummino told CNN International’s World Business Today. "So they are really looking to different countries and different ways to attract that growth." Tummino, who leads the AS/COA Cuba Working Group, notes that many countries are already investing, including Brazil, Canada, China, and Spain. At the Knowledge@Wharton's Cuba Opportunity Summit on April 1, Roberta Jacobson talked about the key steps to normalize relations between Cuba and the United States. The assistant secretary of state for the Western Hemisphere was interviewed by AS/COA President and CEO Susan Segal about her first official trip to the island in January 2015 and how the Obama administration plans to support the Cuban people in this time of transition. Jacobson believes opening embassies and fully restablishing diplomatic ties will be crucial to the process. "We began this process of normalization, but it's very important to understand that the reestablishement of diplomatic relations is only a very small part of normalization, which is a much longer process that will take years," she said. At Knowledge@Wharton's Cuba Opportunity Summit on April 1, AS/COA's Alana Tummino guided a discussion on Cuba's expanding nonstate sector. Now that the country has nearly half a million cunetapropistas, or self-employed workers, there are new business opportunities for both Cubans and foreigners looking to invest. AS/COA was the exclusive Thought Leadership Partner of the summit and maintains a Cuba Working Group. publications about the island at www.as-coa.org/Cuba. In the launch of Entrepreneurial Cuba: The Changing Policy Landscape, authors Ted Henken and Archibald Ritter discussed the evolving entrepreneurial character of Cuba. With a government that rations products and only recently started expanding its licenses for micro-enterprises, Cubans have been forced to seek second sources of income, generating a "makers" economy. 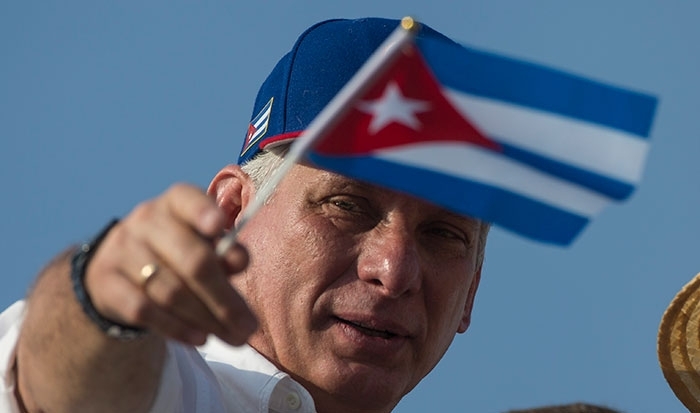 Cuban President Raúl Castro's 2011 reforms grew the number of cuentapropistas (self-employed workers) from 110,000 to about 480,000, said Ritter. However, many of these jobs simply transitioned from the informal to the formal economy. More reforms are needed to support entrepreneurship on the island. Henken suggests eliminating the government's list of legal occupations, which particularly limits professionals, while improving the tax code to lift the burden on private businesses. The scholars also discussed the danger of involving multinational corporations and industries where Cuba can be internationally competitive, such as biotechnology and tourism. Speaking to Bloomberg, AS/COA's Director of Policy Christopher Sabatini outlined how the United States' relationship with Cuba will change. In particular, Sabatini highlights growing entrepreneurship on the island and agricultural trade between the two countries, claiming it will allow "U.S. agriculutral producers to recover a lot of the market they've lost recently." Plus, U.S. ties will irk Cuba's relationship with some Latin American countries like Venezuela, but may give Chile and Colombia greater freedom to advance democracy in the region, he said. The decision to begin normalizing relations between United States and Cuba is a "survival strategy" for the island, AS/COA's Senior Policy Director Christopher Sabatini said on CNN. "The lifeline that Venezuela threw to Cuba...100,000 oil barrels per day, now looks like it's going to dry up," he added. Venezuela's falling oil prices and struggling economy mean that a closer relationship with the United States marks a strategic move for the island, said Sabatini. He also discussed how loosened travel and trade restrictions will effect investment in Cuba. President Raúl Castro’s announcement of his last 5-year term ending on 2018 has raised hopes of a post-Castro era and of a succeeding younger Cuban leadership. AS/COA’s Eric Farnsworth speaks to BBC World News about Castro’s statement as the island undergoes significant political and economic changes. “They’re signaling that there does need to be a transition at some point in the future and I think he’s laying the groundwork for that,” Farnsworth said. AS/COA's Christopher Sabatini spoke to FOXNews.com about Cuba's migratory reform and its potential for change on the island. Due to go into effect on January 14, the new policy lifts the requirement for Cubans to obtain an exit visa to leave the country. Sabatini explained that the change stems from a need to generate hard currency and remittances and to "skim off public frustration" over lack of structural reforms. "It is progress in the sense that more Cubans will be able to travel," he said, but warned the government can still limit travel by controlling the issuing of passports. Sabatini explained that more Cubans may emigrate to the United States through third countries, since the "wet foot, dry foot" policy allows Cubans who enter by land to gain residency. AS/COA's Eric Farnsworth speaks to Al Jazeera about President Raul Castro's decision to lift the travel restrictions in Cuba. AS/COA's Christopher Sabatini discusses Oswaldo Payá's legacy, saying that while the movement for greater political dialogue in Cuba will continue, it will be hard to replace Payá's charismatic leadership, as well as his unique stance between the government in Havana and the exile community in Miami.